While the title suggests this is the latest instalment in one of Jackie Chan’s most successful and continuously entertaining franchises, Police Story: Lockdown bares very little resemblance to those action juggernaut classics. A more sombre and serious affair, albeit with a requisite amount of hard hitting action, Lockdown has an initially interesting set-up, the Hong Kong movie giant turning in a fine performance and even one show-stopping scene of Jackie Chan fight action but is ultimately let down by its own contrived storytelling and mind boggling artistic choices. Chan, playing a different kind of cop from the other Police Story instalments, plays a mainland China police officer who goes to a popular nightclub to meet up with his estranged daughter. No sooner have they met and their troubled relationship is evident the club is locked down by its shifty owner and his cohort of goons taking Chan, his daughter and a seemingly random number of patrons hostage. Said club owner soon makes his motives clear, intending to extract revenge on Chan for an injustice from years prior. However, and despite being older, slower and grizzlier, Chan is still a super-cop and sets about thwarting the owner and his gang in an attempt to stop them from fulfilling their dangerous plan of revenge. Proceedings start promisingly with the set up intriguing and the location of a vast modern nightclub turned into a lockdown prison a novel premise and setting. Chan is on fine dramatic form selling his troubled and tough but good hearted cop and it’s nice to see him not relying on his usual comedy hi-jinks. Everything is played straight here and for a good part of the running time this works in the film’s favour. There’s also some decent action as well, albeit short and sharp scenes rather than sustained bouts of frenetic fight action. Unfortunately, things soon fall apart as the narrative becomes unnecessarily contrived (and hard to swallow), the serious tone gives away to tension destroying melodramatics and, perhaps the biggest offender of all, the filmmakers decide to edit the film into oblivion. For some reason that is not entirely clear, the makers edit almost every scene to excess and not to just the actions scenes either: simple dialogue and dramatic scenes are perhaps the worst culprit. Seemingly attempting to try and include every bit of coverage they shot, the makers cut scenes so quick with so many different shots and angles, making it hard to follow what is happening. This may reflect the confusion and disorientation of the characters but leaves the viewer cold and confused and unfortunately robs the film of the dramatic tension it’s striving for. It doesn’t help that a good portion is told in flashback meaning action scenes/events that have happened in the past erupt suddenly in the middle of characters discussing them, cutting between past and present and rending proceedings even more incoherent. It’s a shame as Lockdown is well shot for the most part and Chan and his cast give committed performances. But the frantic editing coupled with convoluted storytelling and endless reams of exposition make what started out as a tense siege thriller turn into a stale dramatic slog. It’s great they tried to take the Police Story franchise in a different and more serious direction and Chan does get a couple of decent fights including a brutal MMA style dust up with one of the bad guys but the whole execution (style and pacing wise) unfortunately robs the film of the tension it needs. If it had been told in a more straightforward and less eyeball frazzling manner, Police Story: Lockdown could have been a solid potboiler and a nice change of pace for Chan: instead it’s a frustrating blitz of edits and melodrama with a few decent bits of action. Shame. 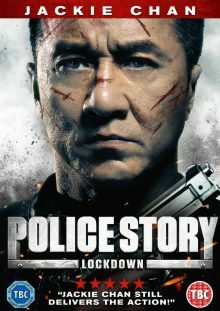 Police Story: Lockdown is released from Kaleidoscope Home Entertainment on digital download July 18th and DVD and Blu Ray on July 25th 2016. Extras include a BTS featurette, some nice interviews with cast and crew and a trailer.